Marketing Concepts Intl, 9781635540413, 302pp. After years of living off their celebrity, Don Quixote and Candide join forces to seek adventure in the modern world. In this re-imagining of literary history the two meet Cyrano De Bergerac, Merlin, Sherlock Holmes, the crew of the Starship Enterprise, Tom Sawyer, Huck Finn, Dean Moriarty, Elizabeth Darcy (n e Bennett) Mr. Darcy and multitude of historical figures, and share unexpected encounters with people from their past. While Don Quixote remains rooted in days of yore, Candide is preoccupied with exploiting all things modern. This rollicking fun-filled tale will entertain the well-educated and erudite reader with tongue-in-cheek humor. 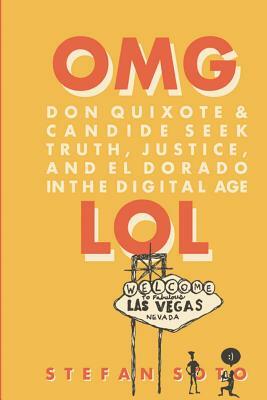 You are cordially invited to join Don and Candide on their quest to find truth, justice and El Dorado in the digital age. Stefan Soto was raisd by a Romani Princess and a Ukrainian circus performer. He resides on an English Canal and has no known address. His early works were banned by most right-thinking European powers. The author invites readers to investigate Cervantes' and Voltaires' original treatments of the title characters.